We’d love your help. Let us know what’s wrong with this preview of Code by Lawrence Lessig. To ask other readers questions about Code, please sign up. "حيث لا يزال كثيرون يعتبرون ان الحرية مثل الطبيعة, وأنها ستعتني بنفسها . لا يزال هناك كثيرون لا يدركون أن المعماريات المختلفة تنطوي على قيم مختلفة, وأننا من خلا اختيار هذه المعماريات المختلفة فقط-هذه الأكواد المختلفة- نستطيع ترسيخ ونشر قيمنا." الكتاب رغم قدمه النسبي –نشر في 2006- فهو يعالج مشكلة حديثة ومهمة ,وهي مشكلة الحرية والقيد في العالم الرقمي في . فالكاتب يبدأ بتبيان كيف أن الانترنت ظاهرة جديدة لا تحمل بين طياتها أي سوابق من هذا النوع , مما أثار مشكلات جديدة .ويبين لسيج هذ "حيث لا يزال كثيرون يعتبرون ان الحرية مثل الطبيعة, وأنها ستعتني بنفسها . لا يزال هناك كثيرون لا يدركون أن المعماريات المختلفة تنطوي على قيم مختلفة, وأننا من خلا اختيار هذه المعماريات المختلفة فقط-هذه الأكواد المختلفة- نستطيع ترسيخ ونشر قيمنا." الكتاب رغم قدمه النسبي –نشر في 2006- فهو يعالج مشكلة حديثة ومهمة ,وهي مشكلة الحرية والقيد في العالم الرقمي في . فالكاتب يبدأ بتبيان كيف أن الانترنت ظاهرة جديدة لا تحمل بين طياتها أي سوابق من هذا النوع , مما أثار مشكلات جديدة .ويبين لسيج هذه المشكلات مثل قيامي أنا كمواطن عراقي بنشر منشورات ممنوعة في المانيا ,فهل يمكن للحكومة الالمانية محاسبتي باعتبار أن مواطنيها يمكنهم الاطلاع على محتوى كتاباتي , وغيرها من المشاكل من الناحية القانونية ويبين أوجه الخلاف في القرارات المتخذة لعلاج هذه المشاكل . بصورة أكثر دقة، سيتم بناء كود للعالم الإلكتروني يحدد الحريات والقيود فيه. لا مجال للشك في ذلك، لكن يظل"
نعم نحن من سنحدد الكود الذي ينظم الانترنت لكن المشكلة من نحن هل تقوم الحكومات- أي حكومات؟ أم نتبع مبادئنا- أي مبادئ؟ هذه كلها أسئلة ذات أجوبة صعبة . لكن في النهاية مهما كان نوع القيد سيبقى الكود البرمجي هو من ينتصر لذلك علينا أن نحمل قيمنا أياً كانت ونبدء بوضعها بأنفسنا في هذا العالم لان أحد أخر لن يفعل لنا ذلك . إننا على وشك الدخول إلى عصر تبلغ فيه سلطتنا في التعامل مع الهياكل المنظمة"
This is one of the seminal books in its field, but even v2.0 has been overtaken by events. It's time for v3.0. So, the copy of the book currently with this reviewer has 410 pages. #aphids - p20, p59, p120, p121, p122, p123, p124, p125, p126, p127, p129, p130, p131, p132, p133, p135, p136, p139, p142, p143, p144, p145, p146, p151, p170, p180, p181, p182, p183, p184, p185, p186, p188, p191, p192, p193, p194, p197, p198, p199, p200, p203, p204, p206, p208, p209, p223, p233, p234, p23 So, the copy of the book currently with this reviewer has 410 pages. On page 20, 'It [Lessig's point] is instead to remark that this space enables more of this duality.' needs to be addressed at,in an appropriate time,setting. And similarly, the differences between over here and over there alluded to on p298. On p22: 'Is there any constitutional problem with [a worm being placed in computer software with judicial authorization]? I don't know, but it seems like there should be. The content of the point-bearing aphid is acknowledged. And concerning the conversation about congestion fees, to what extent do recent trends and developments in custom and practice make that one proceed in better ways? An important point to make would be that the next time one of our guys, gals or Xs over there is picked, we need to know which one it is and to develop proper modalities to handle their stack. Considering the content of p62, has Lawrence Lessig ever met Sir Nigel Sheinwald? To what extent is the two-step aphid an enabler of the low for those whom the we feel contempt, of the middle for those whom the we feel indifferent, and of the high for whose deemed by the we to be either righteous or exquisite, if not both? On p23, the 4-ness difficulties associated with regulability need to be addressed at,in an appropriate time,setting. On p24, 'Why can't we imagine an Internet or a cyberspace where behavio(u)r can be controlled because code now enables that control?' may beg the question as to which behavio(u)r would the we wish to control and why, and to what extent could the we be tempted to substitute choice for behavio(u)r? How concerned should the rest be about that? (see also arguments on p38). On p204, 'Controlling employees (or spouses) is one important new use of e-mail technologies.' appears to beg the questions. The interpretation of the picture painted on p28 needs to be de-convoluted and the nature of Prof Lessig's concerns should be formalised. On page 37, to what extent are-can difficulties of anonymity be resolved by modern cell [mobile] phone technology? What else may be relevant in the context of the content of chapter three? Considering the arguments on pp68-70, is it clear what the components of a digitalID would consist of? What arrangements would be needed to make sure that tracking, identification and content-harvesting processes function in the spirit of the fourth amendment? And what arrangements would be needed to make sure there are no cyber-stateless citizens? And to make sure there are no citizens in cyber-administrative or cyber-indefinite detention? The arguments on p76 appear to have some basic weaknesses; and also in the paragraph beginning "I have spent many pages making a point that some may find obvious." on p77. What else may be relevant with respect to the nature of choice in the arguments on p78? Is enoughfulness a word? Sufficiency may be better, and again "in inverted commas". Considering the argument at the end of p80, how might (an) appropriate separation(s) of government and commerce be configured? And considering the arguments on p209, how much surveillance is enough? Is it possible to elaborate a more compelling definition of cyberspace than the prose on offer on pp83-5 that can include the aphids on pp86-8 in its sentences? And on pp97-102, to what extent are the goings-on in the LambdaMOO space a new and fast variation of an old theme in a frathouse setting? What sort of arrangements may be available to work through the law of cyberspace, per the content of pp102-106 in such a way to prevent an aphid-schmayphid fire? And on p109, there appear to be doctoral programmes available to develop the legal interpretations of arguments projected on or reflected by the over there in a suitably elaborated definition of cyberspace. What sort of boundary conditions may be available to elaborate decent interfaces between the corporation and the staffers on its payroll between real and cyberspace? On p114, it may be desirable to elaborate what the end of better to good regulation of cyberspace would be. On pp138-9, what may "The key criticism that I've identified so far is transparency...Now that's not saying much, at least about us. And there's nothing about cyberspace to suggest things are going to be different.." assume? What else appears to be significant in this context? On p143, be careful with "My own intuition about that is different." for reasons that should be addressed at,in an appropriate time/setting. The arguments on pp155-6 point to a need for the law to account for the regulatory effect of code: apologies if I'm jumping the gun here - if programmers can have a passport that is properly defined for cyberspace, surely the law in the first instance ought to have the effect of saying only a certain pool of programmers can interact with an object either in cyberspace or within a network that has territorial boundaries in certain ways and that would include a prohibition on turning human beings (who have a right to be the subject of certain conversations) into objects, picking them up and putting them somewhere else across or within cyberspace (ah - some of this is addressed on p226; on p258, how decent are zoning arrangements and also those to allow for proper challenge, and where these are either unsatisfactory or non-existent, what measures may exist in infrastructures elsewhere in real space that can allow for functional lives to develop that can find their way in the world both beyond as well as within two county lines?). What else appears to be particularly relevant in this context? The translation argument on p156 seems a little nihilistic. The warrant requirement is placed in inverted commas on p158 in the question "So why the 'warrant requirement'?" and both appear to require particularly careful handling, as well as the arguments running through the rest of the chapter. And on p201, what would the laws of cyberspace need to include to prevent citizens from being picked up, put over there and talked about, even in inverted commas? There appear to be some basic difficulties with the arguments on pp210-4 that need to be addressed at,in an appropriate time, setting. As well as an elaborated answer to question three on p217: answers two and four appear to be particularly unsatisfactory. On p218, it may be decent to elaborate what the implicit charge in "The burden is on you, the monitored, first to establish your innocence..." would be and which [organised crime-backed?!] law enforcement agency would sponsor it. The arguments on the rest of the page and the aphids on p219 appear to present some particular difficulties. The questions on p220 appear to be interesting and can be addressed at,in an appropriate time and setting. How might the law distinguish between manipulation on the one hand and coercion on the other, and what are considered to be facts in each case and how are/might determinations (/be) made about what matters? To what extent do the arguments on pp224-5 hold true? And on p229, to what extent does Prof Lessig need to turn the reader's inalienable right into a liability rule in order for him to be able to exercise his privilege, and in doing so, to what extent would that set aside the reader's 13th amendment rights in the US and be in breach of part one of the Modern Slavery Act in the UK? And to what extent might the general welfare be enhanced by spacializing privacy as opposed to propertizing it, and if these concepts boil down to the same thing, would it be easier to compile the ground rules? On p242, how might it be possible to frame and pose a better question than 'How can we reestablish credibility in this space so that it is not lost to the loons?' On p263, Prof Lessig is particularly concerned about the process-less blocking of blacklists: it may be appropriate to review how satisfactory current domestic and international law is concerning blacklisting, administrative detentions, control orders and related topics in real and across cyberspace to include the extent to which these activities can be sponsored and implemented by third parties and jurisdictions. The arguments on p269 in inverted commas need to be addressed at,in an appropriate time/setting as well as consideration of where the thus far and no further textbook boundaries may be set for the use of intellectual property. "A faithful reading of the framers' Constitution" quoth Prof Lessig on p275, "would strike down the regime of spectrum allocation." Quoth he further "The model for speech that the framers embraced was the model of the internet..." but surely, this would be to conflate a person's expression with the infrastructure available to convey the message on broadcast media? Separating the two, it may be sensible to elaborate how editorial independence and related matters would sit between them. We have an interlude on p276 - hurrah! Lessig's updated version of Code 2.0 was a requirement for a computer science elective I am taking. While I wouldn't say that I would have chose this book to read if it weren't part of the course, I actually found the material quite interesting. The governance of cyberspace is something that most governments have not figured out how to accomplish effectively. Lessig lays out a plan for how this could be accomplished. Again, if you are not overwhelmingly interested in the subject or have a desire Lessig's updated version of Code 2.0 was a requirement for a computer science elective I am taking. While I wouldn't say that I would have chose this book to read if it weren't part of the course, I actually found the material quite interesting. The book tackles a very interesting topic: regulation in the age of cyberspace. Now, this 2006 book is a rewritting of a 1999 book, so today it's rather dated in its more technical details. Lessig argues that the Internet is moving away from its early ideals of freedom, anonymity and decentralization. The regulatory power of code in cyberspace could make the Internet "the most regulable space of human activity". That's one of the main statements of the book, which he develops convincingly in gre The book tackles a very interesting topic: regulation in the age of cyberspace. Now, this 2006 book is a rewritting of a 1999 book, so today it's rather dated in its more technical details. Lessig argues that the Internet is moving away from its early ideals of freedom, anonymity and decentralization. 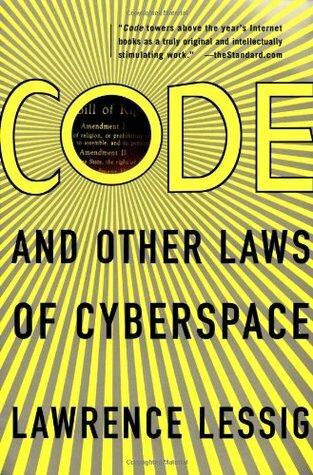 The regulatory power of code in cyberspace could make the Internet "the most regulable space of human activity". That's one of the main statements of the book, which he develops convincingly in great detail. He then analyzes the implications of the regulatory balance in cyberspaces for issues like free speech, copyright and privacy. In each case, he takes a stance based on what he sees as the American constitutional values (that is, his position is according to the spirit of the law, not the letter of the law). Lessig is a fine writer and, as a lawyer, builds his arguments nicely, step by step, with lots of relevant examples. I mostly agree with the way he puts the problem and up to this point I find his analysis and critique spot-on. However, when it comes to solutions, it seems to me that he is technologically naive. Perhaps it isn't true. Perhaps that's what was to be expected in 2006. But in 2014, the knowledge of what has come to pass undermines the reading of his book. And it's a pity. Most of the problems he identified are still topical. Most of his legal, political and even technological critique is still valid. The examples he brings together are useful as mini-history of the recent developments of the Internet. So, if you're interested in the subject, don't let the dated parts of the book discourage you. It has plenty more to offer. In Code: Version 2.0 Lessig gives us the best kind of general-audience academic book. He focuses on asking questions and presenting frameworks of thought, but he doesn't hide his own opinions about how those questions should be resolved. He synthesizes literature and provides good references, but in an unobtrusive way that doesn't interrupt the flow of his own writing. And most importantly, he opens the door to an exciting array of ideas. Personally, but I found most interesting were his theories In Code: Version 2.0 Lessig gives us the best kind of general-audience academic book. He focuses on asking questions and presenting frameworks of thought, but he doesn't hide his own opinions about how those questions should be resolved. He synthesizes literature and provides good references, but in an unobtrusive way that doesn't interrupt the flow of his own writing. And most importantly, he opens the door to an exciting array of ideas. Personally, but I found most interesting were his theories of latent ambiguities in constitutional values (an idea I've seen hinted at, but never explained, by less sophisticated constitutional theorists) and the way he works with the interaction of laws, norms, markets, and architecture. In the process he gives a useful framework for thinking about government to those of us who are skeptical about the products of contemporary American democracy. This book goes over the new challenges that the internet introduces. Gone is the idea of a black and white geological location of anyone connected to the Net. If you buy Nazi paraphernalia (ignoring for a moment the shameful fact that there is such a thing) in France from a person in the United States you've broken the law...or have you? In France, it's illegal to buy anything Nazi-related, in the US it's not. This is but one example of the new problems we're dealing with because of how the inte This book goes over the new challenges that the internet introduces. Gone is the idea of a black and white geological location of anyone connected to the Net. If you buy Nazi paraphernalia (ignoring for a moment the shameful fact that there is such a thing) in France from a person in the United States you've broken the law...or have you? In France, it's illegal to buy anything Nazi-related, in the US it's not. This is but one example of the new problems we're dealing with because of how the internet is designed. Lessig advocates the very code of the internet being the solution. You can write code that would prohibit anyone in France from even seeing anything Nazi related on the Net. But to do this, you'd have to track the location of his (or her) IP address; which raises the question of privacy. Is tracking your every mouse click, also poetically called "mouse droppings", is that an invasion of privacy? There are no clear cut answers to these questions. Very easy to read, but a bit repetitive. This is an interesting introduction to some regulation debates surrounding cyberspace. It also proposes a specific fix to some of the problems (a coded ID system which would eliminate some of the anonymity of the web) which seems a bit too neat. Having such a solution in the book is both a great virtue of it and a downside as well. The good part is that this solution makes the book not merely a series of paranoid criticisms, which is too often the norm in Very easy to read, but a bit repetitive. This is an interesting introduction to some regulation debates surrounding cyberspace. Having such a solution in the book is both a great virtue of it and a downside as well. The good part is that this solution makes the book not merely a series of paranoid criticisms, which is too often the norm in books about cyberlaw/crime/society. But it is also somewhat of a detriment, because as I read, I became much more interested in Lessig's insightful perspectives and the problems he brings up, than his solution to these problems. An interesting take on the internet and digital technology in general. Lessig claims that far from being an anarchy, the internet is bound rigidly by a set of laws: its code. By changing the design of the code, we change the space, the culture, the use. Lessig argues for a series of changes which he thinks should be made to the code. Many of these deal with the intellectual property, copyright, and ownership issues which Lessig deals with at Creative Commons. This is the older version of the book An interesting take on the internet and digital technology in general. Lessig claims that far from being an anarchy, the internet is bound rigidly by a set of laws: its code. By changing the design of the code, we change the space, the culture, the use. Discussion of the internet and related information technologies from a legal and regulatory view. An excellent presentation of constitutional issues arising from information technologies, covering such big-ticket topics as privacy, sovereignty, free speech and protection of intellectual property. I found it to be a thought-provoking and informative coverage of these issues that goes well beyond considerations surrounding information technologies. A great book - Dr. Lessig is a gifted thinker, and this book (both versions) were prescient in identifying what have become increasingly important issues surrounding the Web. It's not super accessible, but if you care about these issues, especially from a legal or policy perspective, then this book is a must-read. A great book. It gives me a fresh look at how technology affects laws (and how people react to it). Lessig is one of my fav writers. This book is a must if you want to study (or just want to know the issue around) cyberlaw. Granted, his view is more closer to the open source and anti-IPR people like me. while i appreciate the updated-as-a-wiki sort of thing, it reads as if it were written by committee. which is very disappointing since Lessig's other books show that he is actually a fantastic writer. Still, good info if you're into it. This book has some fairly interesting perspectives on our situation of being in the real world and cyberspace at the same time, and what that means for everything from copyright to consumerism. However, I think it was overly wordy and got into too many side topics. Incredibly insightful and densely packed. Lessig not only examines the implications of online design and functioning (and of the decisions made that result in and/or support both); he offers well-thought-out approaches to combating the more troubling aspects of the digital world. I'm skeptical (and a little surprised) by Lessig's willingness to embrace a top-down architecture approach to net design, but this book is a must-read for anyone that wants to be more than just a surfer. The first edition of this book is slightly outdated. But nevertheless, it is interesting to reflect on what has actually happened from the predictions of this book. I find the language a bit boring at times, maybe because it was written by a lawyer. Some interesting stuff here about how regulation and code are interdependent. Very dry though. To many big words! Damn Yale professors. But good content. A well-reasoned classic that needs an annual update. He is a director of the Edmond J. Safra Foundation Center for Ethics at Harvard University and a professor of law at Harvard Law School. Prior to rejoining Harvard, he was Lawrence "Larry" Lessig is an American academic and political activist. He is best known as a proponent of reduced legal restrictions on copyright, trademark, and radio frequency spectrum, particularly in technology applications. He is a director of the Edmond J. Safra Foundation Center for Ethics at Harvard University and a professor of law at Harvard Law School. Prior to rejoining Harvard, he was a professor of law at Stanford Law School and founder of its Center for Internet and Society.